The warm embrace of death: Luxor’s West Bank. Bike-riding around the villages on the West Bank seemed like a great way to end our stay in Luxor, so after a lazy morning and a trip to the Luxor Museum (real mummies and all) we hopped on a ferry across the Nile. The one-pound fare and three minute trip across the river was the most smoothly functioning service we’ve encountered this trip. 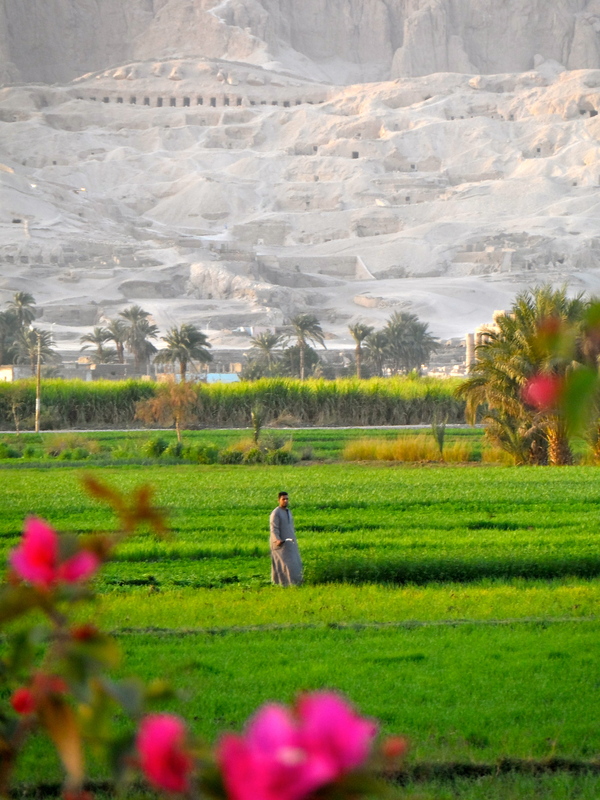 Just as the sun rises in the East and sets in the West, the main temples and palaces are on the East Bank of the Nile and the tombs are all on the West Bank. Our tour guide (who had studied Egyptology for years and can read Hieroglyphics) told us this was done on purpose for this reason- life on the East, death with the sunset. Pretty cool, right? After hiring some rickety old bikes, we dodged minivans, potholes and motorbikes to make our way into the alleyways of the main village. We precariously trundled around the backstreets looking for a couple of hotels for our next stay (yes, we’ve already decided to come back). It was a bit silly, we spent a lot of energy haggling over hire prices and finding good bikes (‘good’ being a relative term) before riding a maximum of 100 metres and deciding to stop for lunch. In our defence, it was one of the best meals we’ve had. Having to wait for the chef to be phoned in to the empty hotel didn’t bother us given the location- we had a view across the Nile and of Luxor Temple all to ourselves as we sat on the beautiful rooftop. Hungry for more stunning views, we wobbled along on our bikes toward the Colossus of Memnon to watch the sunset. This site is still mainly buried, so it’s a working archaeological dig project. It was cool seeing the in-progress restoration of one of the largest temples ever built. Sam had wanted to go up a hill to get a better view of the sunset (which was stunning! ), so we rode towards the mountains standing tall on the West Bank horizon. Half way up an empty dirt track we were stopped by a five-year-old who told us first that it was prohibited to walk up this path, and then that he could accompany us for money. No thanks. Not wanting to offend, and being quite interested, we walked over and were introduced to her family, given cups of tea and shown their starving donkey. Their house was made of mud-bricks and the family had lived there for 3 generations. It was by Australian standards uninhabitable, but they were proud to show us their home, and we were torn between apprehension and amazement at their generosity. Hussain, the eldest male, invited us into their house (we had been drinking tea and talking just outside the front door, sitting on their only outdoor couch, a simple but functional one made from wood). The main outer wall was painted as one giant Egyptian flag, the inside had no furniture, but there were torn newspaper pages stuck to the walls like pictures. This was Hussain’s house, the rest of the family lived next door. It was like a cave inside, and we were both now extra nervous. We were inside and the steps were taking us partially underground. This is when we gave our thanks and tried to leave. They didn’t put up a fight and said polite and warm good byes. Given that so many locals are constantly hassling and trying to obtain money from us, it was hard not to be a bit suspicious. The little boy could not stop looking at our bags, and was almost snatching his own hands away from them. It seemed to be his natural instinct, but he also, confusingly, made warm gestures to gain trust. He kissed his palm and closed hand before shaking Sam’s hand, presumably to show he was no threat. 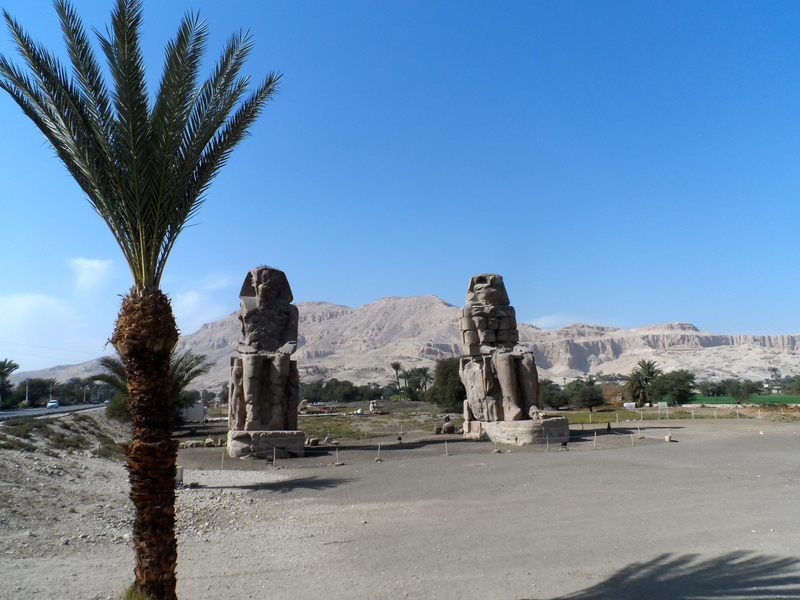 The sister, older brother and mother were all incredibly hospitable and friendly, and insisted that we call them when we return to Luxor. They even gave us both a scarf as a gift. It was only after we left that we realised how genuine they were, and were a bit disappointed at our own lack of trust. On the ride home we chatted about how many families just like this one there must be in a country of 90 million. Many mouths to feed, a starving donkey, and no money. We also talked about how lucky we are in Australia to have a stable system of government. It’s so clear here how important that is as a building block for all forms of prosperity. However, this lack of stability and wealth has not stopped the indomitable generosity of so many, as we have experienced a number of times now. From a shisha café in Luxor, where Mahmoud keeps telling us we are more Egyptian than Australian, we both agree that we love Egypt and Egyptians. Tomorrow: Onwards to beautiful Aswan! ← Security in Egypt: Surviving the revolution.